Just yesterday, in the late afternoon, I noticed that the sun had moved. It inches around our house throughout the year. We see the setting sun from the front windows during the winter and from the back windows in the summer. I know that it's not the sun moving, but from our earthly perspective it's the sun that seems to tilt and shift rather than the Earth. I like Spring, but it's not my favourite time of year. Such capriciousness - one day cold, the next warm-ish, and often with a wind that drives through to the bone. Dickens wrote, "It was one of those March days when the sun shines hot and the wind blows cold: when it is summer in the light and winter in the cold." We met some friends for coffee down in Oak Bay today. Such beautiful blue skies. A few prunus trees are beginning to blossom. Halyards clinked and masts swayed in the marina. After coffee we took a short walk so Tim could get a closer look at a Trimaran washed up on the rocks, probably by one of our storms. Don't let those boats bobbing about fool you - the wind was sharp and biting. I spent some time wandering around the garden in the late afternoon. 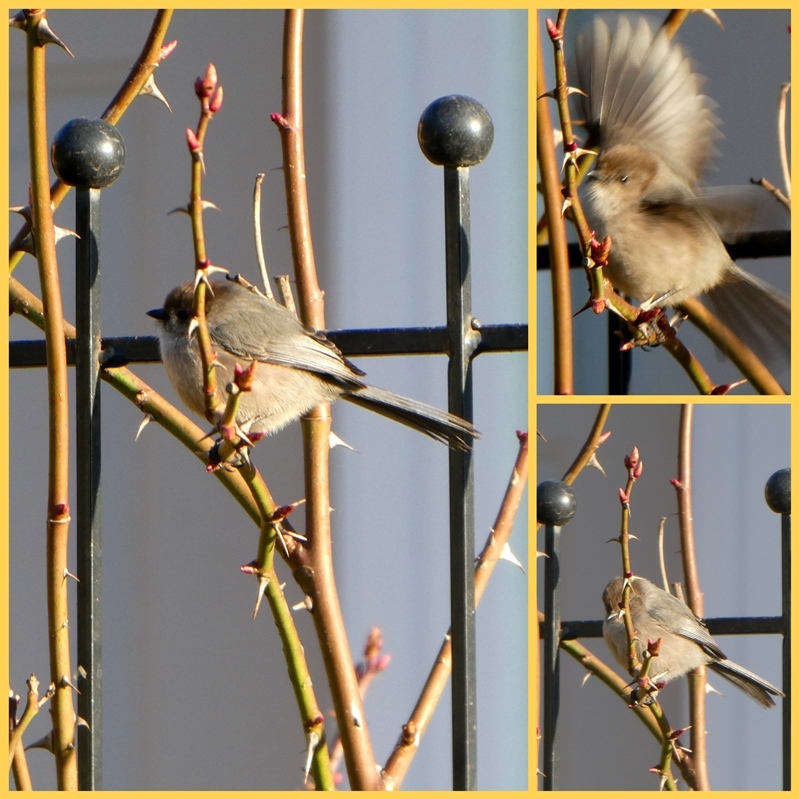 A couple of little Bushtits darted around the bird feeder, diving in for a quick nibble, then darting out again to land on a nearby rosebush. Such agility to miss those sharp thorns. This semester at school is an easier one, with courses I've taught before and delightful students. I've had more time for home pursuits like reading and sewing. It's lovely. A bunch of tulips has given enormous delight over the past couple of weeks. They have gone from tight buds to fully open flowers with curling fringed petals seem to turn to silk as they age. In my garden again, tiny Tete-a-tete Daffodils sprang up to brighten a few corners. I can see them as I work in the kitchen and they remind that in spite of the continuing chilly temperatures, the season has turned the corner and Spring is almost here. Is Spring's arrival soon in your area? Daffodils! In your very own garden! I have heard such things are possible )) ....actually I remember them and I remember Spring....which kind of doesn’t actually exist here in this part of Florida. The birds seem to know it’s that time of year and there are some different flowering trees, but temperature-wise, we don’t notice much difference from winter to spring. Thank you for sharing yours. The early Prunus blossoms are such a happy sign of Spring. Here we have beautiful Magnolias in so many of our local gardens. I think the season has turned the corner, at last. Lorrie - with four feet of snow on the ground, and massive icicles suspended from our eaves, it's quite hard to imagine that you have daffodils in your garden! Having said that, we have emerged from the deep freeze and it was gorgeously sunny today. Just a matter of time. Thanks for adding your lovely photos to our Mosaic Monday collection today - my favorite is the one with the shadows from the trees, with the marina in the background. Such lovely photos, as always. I love the shot of the marina. I can imagine that it's warm, even though you have described the wind as biting. Your cup of hot tea must have warmed you a bit. It was a cold, rainy weekend here, but there is promise of spring-like temperatures this week! I feel the SAME way about Spring. She's fickle . But we are a bit farther west from Lake Michigan now so we get less LAKE EFFECT weather. In other words, we may get a real spring . So many signs of spring. I have not seen any blossoms as advanced as yours. Good pictures, so enjoyable Lorrie. Your photos are so pretty and the way you put words together is so delightful. I love the trees with their bare trunks and the blue of the skies you show. We are stillstrongly in the middle of winter - but the light has increased! Happy MM. Well you are right, it looks warm! Warm and beautiful! It does not look warm here. The three inches of snow predicted yesterday turned into six so the mountain range of piled snow being created in my drive is ever higher. I predict spring to arrive in late May or early June. I am glad that this semester allows you a breather. That’s a gift that you will not waste. Such pretty pictures! It was 72 and sunny yesterday here, but today it is cloudy and high of 50. We will be in the 50's to 60's the rest of the week, so yes spring is slowly arriving here. We are into late Spring weather here and have lots of wildflowers blooming. It was 82 degrees when we hiked yesterday which seems pretty warm for March...even here! But I love summer weather best so I won't complain. Love your little bird and the daffodils! It's nice to hear you are enjoying your teaching this semester too...even more than usual. Hugs! Yes, Spring is coming and the snow is melting. They are talking about another snow event this week, though. We'll see if that comes to pass. How nice that your new semester is more relaxed for you. Lovely photos and sweet mosaic/collage. No little spring flowers blooming yet. The only thing popping up is yard art that has been covered with snow. Absolutely gorgeous photos. What a gift you have for artistic photography and beautiful words. Your blog is such a delight. Thank you for sharing with all of us. Very nice floral shots. Of course, I love the teacup on top of the book image. Most of our snow has melted thanks to yesterday's rain. On Thursday, the temperatures may even climb up to double digits. I wish! Here in Bangkok, every day is a full on walk in a sauna day! I've always liked Spring and indeed any weather that is changeable since we have lived in Melbourne famous for its four seasons in a day climate. That way if it is ever hot or cold you know just wait and it will improve. Loved your word capriciousness, yep that's what I love! Beautiful post and photos especially the gorgeous Bushtits! Beautiful, beautiful photos! I am so ready for some springtime...actually we have already had a very early start but then it got cold again. The problem here is, spring quickly turns to HOT summer! I enjoyed mowing our lush green lawn today, so I know spring is here. But it's been a cranky spring so far. Warm one day, cold the next and so many, many rainy days. But I hope we're past that! I think we had our April showers (think deluge) early. I'm glad this semester is easier for you. I think you've shared some lovely photographs, always a joy to see. Those bushtits are so delightful - we don't see them here. Our birds are beginning to busy themselves, some really seem to be seeking out nesting places. Glad your work is going well Lorrie and your students are behaving! Like you, spring is not my favorite season either - but these slightly warmer, drier days are welcome. We've been walking the neighborhood today and notice many blossom trees out and loads of daffodils - color is needed after all the shades of brown. You have a lovely way of describing this season here. I love that Dickens quote! It is exactly describes the weather here lately, since the rains paused. But rain is on the forecast. Yesterday I didn't try to walk because of the biting wind. Today was better and I sat in the sun! ...Lorrie, you indeed live in a beautiful area, we all do. I hope that each day you are able to find joy in your everyday surroundings. I loved seeing your tree blossoms! We had a foot of snow yesterday so Spring seems very far away. Actually, we can get snow till may so spring is basically a very quick season here. I don't care for early spring weather either, but come late spring, it really can be lovely. Right now, as the snow melts, and everything turns muddy, and nippy winds, you are right, it is not the loveliest thing, but it does mean that nicer days are on the horizon. At least the sun is shining too! So thankful to hear you have a wonderful semester, and have more time for sewing and reading, what a blessing that is! Always enjoy your pictures and your thoughts. Still no signs of any flowers here, my garden is still covered in 2 feet of snow, but with the 50-60+ temps coming next week, we ought to see some big changes. I'm not looking forward to the mud though! The daffodils are coming up here in Oregon too - yay Spring is almost here! Enjoy your spring break Lorrie.